The walls were covered with the lovely seashell-plaster pattern that also covers the ceilings of this house as well as the interior of each closet, and the basement walls. It is impossible to sand, scrape, paint, or even clean- so the dirt and dust clung to the rough texture like crazy. Also, these shelves were so deep, it was impossible to reach anything that was in the back.They also happened to be made of cheap fiberboard, which was charmingly both sagging and disintegrating. When we moved in, we flipped the shelves over, hoping gravity would pull them back downward (haha) until we could think of a better solution. As you can probably imagine, I was in organization heaven. I love when everything has a place, and we came up with this design with that in mind. My favorite feature has been the drawers- and yes, I do actually use them (to answer one FAQ). Obviously, it is not quite so immaculate in this photo. There is this little creature who lives in my house named Cooper… and he likes to make messes. These DVDs just provided too much temptation, so I made a few changes! You can read more about the changes I made here. They were subtle things, but you will notice primarily that the DVDs are gone, which is much less stressful. How is that white paint holding up? So far, so good. We used Benjamin Moore Aura High Gloss in Simply White. Since I had experienced some chipping in my office built-ins, I went ahead and added a coat of polyacrylic. I think that may be the key, they have stood up well to a three-year-old and five-year-old that like to stand on the bottom shelf. I can’t find the wire baskets with label holders that you use- what happened? Every once in a while, they will pop back up on Amazon, and then sell out quickly again. It’s an odd thing- I didn’t have any problem originally ordering 4 of them, but then I went back soon after for more for my craft room there were limited quantities. I will try to share on my Facebook page if I happen to notice them back in stock! At the time of this post, there are currently 11 baskets in stock here! The pantry is 48″ wide, 84″ tall, and 24″ deep. We did “waste” some space by building it to the size of the doorway opening rather than making use of the full closet cavity- but I have no regrets about that. Sometimes too much space is a bad thing in organizing! Do you really keep it this tidy? Honestly, it is fairly easy to keep clean and organized. And I am not a naturally organized person. The DVDs were the only messy part, and they are now all gone. Even if the kids leave things out of place, it takes about two seconds to pop them back in order. Where is this in relation to the rest of your kitchen? Here’s a somewhat awkward angle showing you the whole room. It’s very long and narrow. It’s actually 18″ narrower than the houses in our neighborhood with similar floor plans. This was the difference that meant we couldn’t have an island with seating. It also means a little “hike” to get to the pantry from the stove, as some have pointed out- but it’s really not a big deal. I wasn’t about to move the whole pantry, so this is something that doesn’t even register as an inconvenience- I can walk across my kitchen to get something if I need to. Please note the seashell ceiling plaster that I mentioned above. Imagine the walls covered in that as well. Where are all of your baking supplies? And this really can’t be ALL of your food… My baking supplies reside in the upper cabinets by the stove, until my dreams of a “baking center” are realized (I will share the inspiration photos for that someday). I’m planning a cabinet interior tour for this summer, so you will see the baking supplies then. And yes, this is truly all of our food… I swear I’m not hiding it anywhere ;) Details about the original basket & accessory purchases can be found here. The only important difference is that we are no longer selling the aqua labels- I’ve switched over to these chalkboard labels instead. I hope that answers all of the questions for the pantry- if I missed one, please feel free to ask away in the comments! this looks awesome- I love how it all turned out! I like the last picture that shows the relation to the rest of the house. Can you share where you got the little remote device that hooks up to your media stuff that controls your tv? I’d love to get my hands on this as I’m about to lay a new laminate wood floor and can run wire to my pantry from the living room. Thanks! Its called a Cat5 remote extender- we can’t remember exactly which one we purchased (there is no label on it) but we found it on Amazon. I hope that helps! i love how it turned out. you did a great job! Now thats what I call a pantry! I love how organized and open it looks. I just found your blog via StumbleUpon and I am loving it! You are amazing and your house is gorgeous. Following you so that I can see more! Do you have a tutorial for how you made the slide out drawers? Love this! 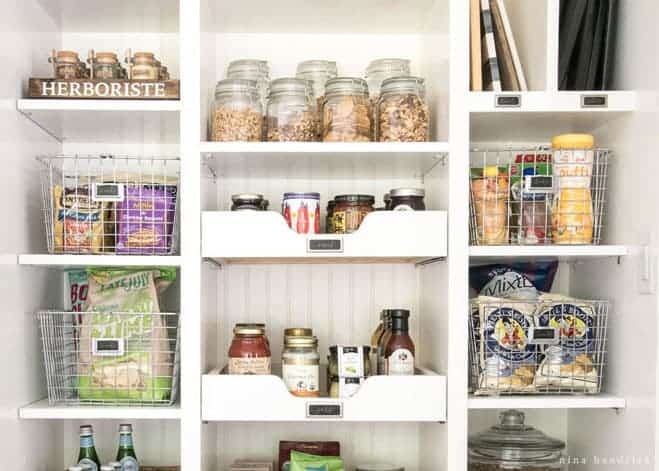 this is awesome.ive been putting off doing my pantry because I just couldn’t figure out what to do. Now I know! I’m wondering if the weight of all the canned goods on the door will cause the doors to sag eventually and cause them not to be able to close. I’m thinking maybe lighter items like snacks or even boxed foods would work? Hi! 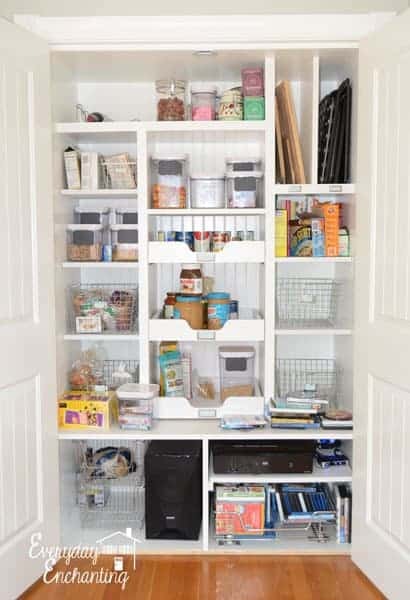 Did you make the pull out drawers for your pantry or did you purchase them? We are trying to figure out level of difficulty in making them. Thanks for sharing, your pantry rocks! Hi Heather! My husband made them and says they aren’t a beginner project- he’s an experienced woodworker and found them extremely challenging to get the spacing right for the slides. However, if you are an experienced woodworker, I say give it a try! A lot of the plans on AnaWhite.com involve similar drawers! I hope that helps. Wow! your pantry looks amazing! We’re in the process of redoing our pantry pretty much the exact same, you wouldn’t have the distances between your shevles etc. handy would you? And the depths of everything? 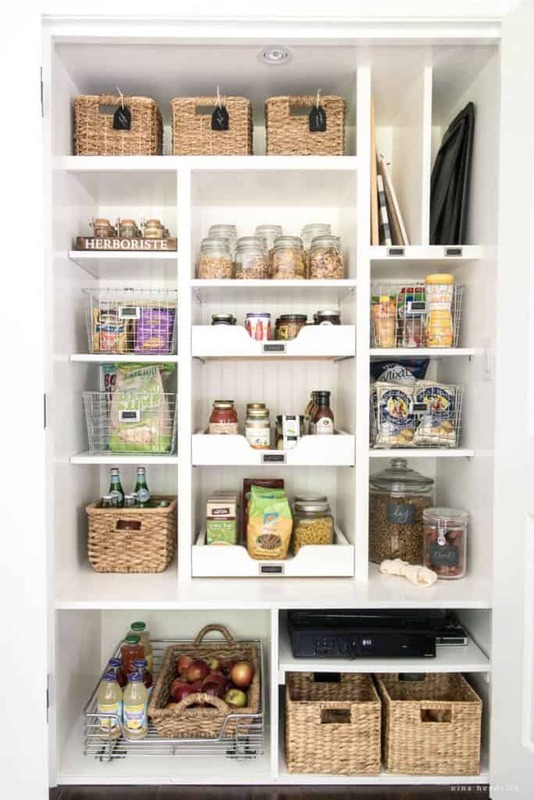 The old pantry in our place is almost just like yours (44x88x24) so I’d love to plan ours similar to this! How did you get the 30×80 doors to work? Hi Saira, I am in the process of creating detailed building plans for the space- it’s a ton of dimensions, so it would be a lot to type out in a comment! :) If you check back soon, it will be up sometime in June. Hi Nina, this looks like exactly what I need…but since neither of us is handy, I’ll need to rope an unwitting brother into helping me. Were you able to post the detailed plans? Thanks!